I haven't blogged in a long while. I've gone back to work, back to jewelry making, I'm starting to go back to my drawings now, and life in general. I've been walking....and walking....getting ready for the Avon Walk for Breast Cancer which is now only 50 days away. Eeeps! You know that Ani graduated, but since my last writing, she has taken her NCLEX (nursing license exam) and passed and is now a full R.N. My son Nareg turned 30 - a wonderful occasion to see how my little boy has grown into a man (and a kind, compassionate one at that!) I really have a lot to be thankful for. But then there's the garden. There's a lesson to be learned here, and I'm trying to figure out what it is. Remember how adamant I was about digging and getting the garden ready before my surgery? That was a little over 3 months ago. I worked for a week, digging and weeding, turning in new soil and planting. It was all set. And for a while it was good. The peas did well (see previous blog posts), and I harvested quite a bit, but the weather got warmer and the plants maxed out. But what about the other stuff? The tomatoes, the squash and cucumbers? The peppers and green beans. Pffffffffttt! I don't know what happened. Whereas my sister Susan is sharing mammoth sized zucchini with me, I have not had one. My coworkers are bringing in bumper crops of tomatoes, I have maybe picked a handful of golf-ball sized thick-skinned tomatoes. I had one really good green pepper...and just picked two half sized red ones (I left them on the plant thinking they'd get bigger...they just got red...:::shrug:::). One eggplant. One small yellow squash. No cucumbers. I have watered and weeded, and put in my time. So what's up? No clue. I do know that I have a possum that comes out at night and if I don't harvest my tomatoes in time, he'll help himself to them...but that's not it. What I DO have though, are sunflowers. They are just getting ready to bloom. I had planted them around the border of my garden (so they wouldn't block the sprinkler spray and deprive my veggies of water). They are magnificent. Tall and strong, turning their faces toward the sun. A reminder of God's beauty and artistry. I have an army of them. A source of joy when I go out and look at my otherwise failing garden. I have been thinking about this lately, because yes, I am disappointed with my garden...but how can I be when I have something so amazing right there in front of my eyes? And I thought about what I've been through over the past several months. Before being diagnosed, I had worked on getting healthy. Losing weight, eating right, exercising. I had put in my time to make myself a healthier person. Despite all this effort, I was diagnosed first with colon cancer, and then with breast cancer. I underwent surgeries. I recuperated. I followed doctor's orders. And I, thank God, am well. I may not be "thriving" yet...but I'm doing okay. Giving off a tomato here, and a pepper there (metaphorically speaking, of course.) But still, I'm doing okay, y'know? But oh, the SUNFLOWERS! They're the blessings in my life: my children, my family, God's presence, my ability to help others, compassion, peace, and love. They are more than thriving. They are starting to BLOOM. This is what is bringing me JOY. I am thankful for all the parts of my garden. The ability to even have a space to have a garden. The strength that I enjoy to work in the garden. The blessing of having clean water in pipes that flow to water my garden. And even for the disappointments of failed crops. And I'm definitely thankful for the SUNFLOWERS! Reminders of God's presence in my life and the gifts that I am so richly rewarded with. The year is half over, and time is speeding by. After my last post, I was thinking about the ordinary everyday things which, thankfully, life is full of. A lot has gone on since my last post, but there haven't been any major milestone events...so I thought I'd just do a general catching up and share what life has been like. Healthwise: I continue to heal and get stronger. I'm walking now, 3-4 miles a day (about 5 days a week). This weekend I am upping that to 5-7 miles. We're training for the Avon Walk in September where we need to walk 39 miles in two days. So walk we shall....to toughen up the tootsies. My entire abdominal area and new breast are still numb. This past Saturday we were at the beach. I was sitting in my sand chair and thought I'd lie on my tummy for a while. WRONG. I don't know why I thought I could do it. I guess it felt so "normal" to be spending the day at the beach. One flip on the tummy and I knew it wasn't a good idea. Just a little reminder that things are still healing inside. My last doctor's appointment went well. Scar tissue on the side near the underarm....nerve damage from the lymph node dissection so still no feeling in the upper underside of my arm, but generally, things are healing well. Admonishments for "no lifting", "no yoga," and "no ab exercises". The tram flap scar is healing well. We will complete the second part of the breast reconstruction in late August as an outpatient procedure. I've been doing a little work around the house. I've always wanted to create a living space on my front porch, and this past weekend made that a reality. 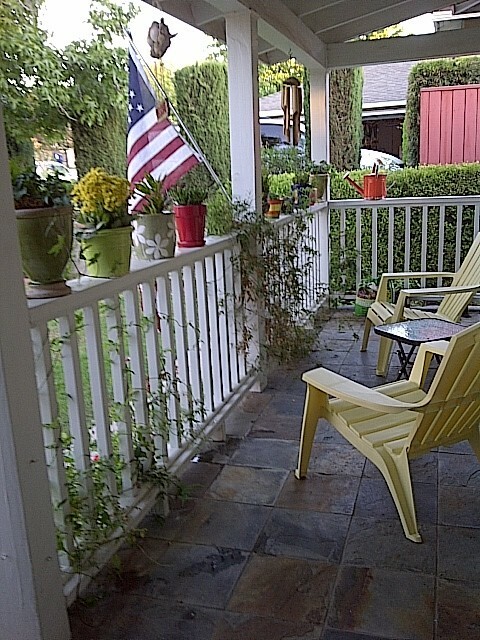 We bought a couple yellow adirondack chairs, and I potted plants in colorful planters and picked up a little table, and voila, we have a place to sit, read, have coffee, relax on the weekends or warm evenings. The garden is growing. I've added butternut squash, roma tomatoes, nasturiums, more green beans. I've been picking handfuls of chinese peas daily. The weather is almost too warm for them to continue, but the vines are over 5 feet tall. That's amazing considering I planted them prior to my surgery, only 8 weeks ago. On the Pomegranate & Eye front, some exciting news! I ordered a kiln! Yep, after months of researching what type of kiln and what type of capability, I bought a Paragon SC2 with a bead window (so I can expand to beadmaking at some point). The new kiln will enable me to work in copper and bronze metal clays. Along with the kiln I ordered the clays, and tools I'll need and some supplies. I'm really excited about it and can't wait til they deliver. Many of you have asked about the drawings for the book I was working on for the Eastern Diocese of the Armenian Church. I'm happy to say that work on that is going to resume starting next week. I had to take a break because of all the health issues, but I'm finally able to sit in one place long enough to get started on it again. And then mixed in with all that we celebrated our 7th anniversary on the 3rd; enjoyed family on the 4th; and celebrated my husband's birthday on the 5th! So there you have it. Celebrating the ordinary. Life is good and everyday is a blessing!